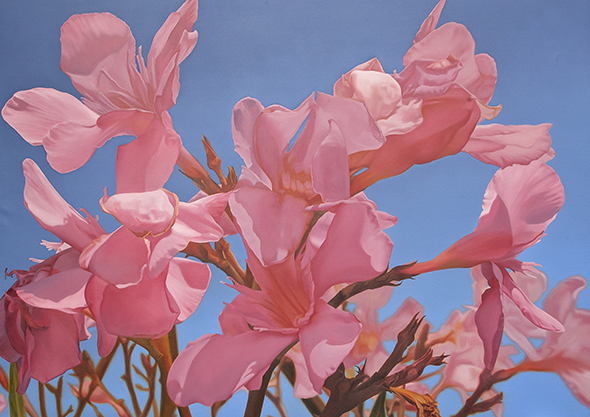 Mustafa Hulusi, Oleander 2, 2016. Oil on canvas, 215 x 305 cm. © Mustafa Hulusi. Dirimart is delighted to announce Negative Ecstasy, an exhibition by London-born, Turkish-Cypriot artist Mustafa Hulusi. Negative Ecstasy consists of six new major works by Hulusi, each of which probes differing notions and physical manifestations of division. The concept for the exhibition is based on French philosopher Georges Bataille’s assertion that consequential art involves a rupture between the boundary of life and death; the mixing of the sacred and the profane; or put another way, a communion between the bounded self and the immeasurable void. Hulusi’s works extend these ideas beyond the spiritual, to reflect on the punishing realities of geopolitical borders, those man-made containers of identity, which shape our ideology and define us as people. Mood Reel (2016), an eight-channel video installation, presents a multitude of contrasting and complementary scenes, borrowing techniques of conceptual collage commonly used in contemporary mass-media and fashion, while also drawing on the untimely modernist imagery of the Third Cinema movement. These scenes evoke the struggle for independence and national liberation; the Fanonesque effort to dig the grave of declining empires. Echoing configurations seen in Mood Reel, the ceramic-tile installation Ambient (2013) presents a contradiction; this wall-mounted artwork is manufactured from durable glazed tiles, yet its surface stages a dynamic ceaseless pattern. The work’s un-resting movement-without-finality displaces any fixed notion of resolvable identity, while at the same time its physical properties and references appear domestic and familiar. Close by are the even more visually fragile “Mediterranean Paintings” (2013), a series of small, seductive photographs of hyperrealist paintings depicting florid 16th century Venetian and Mediterranean glassware. A shift in our understanding of temporality and our acceptance of a certain material quality occurs here; the “Mediterranean Paintings” elicit moments of disorientation in time, imbued with the provocative potentiality of the ecstatic imaginary. Pomegranate (2015) is the outcome of a transformational process that begins with an authentic encounter in a neglected pomegranate orchard. The rotting fruits were captured as photographic images and then circulated as a billboard campaign, before materialising in documentary form in newsprint. These fruits that have passed their sell-by date give us fresh hope, transforming that which is rotten, decayed and discarded into the sacred. The newly produced suite of paintings Oleanders (2016) epitomise the Bataillean ideal most vividly. These prevalent, yet poisonous Mediterranean flowers are rendered in vivid pinks, bursting in full bloom against a brilliant blue sky. The flowers represent the dichotomy of our present condition, simultaneously embodying our mortal drive towards both pleasure and destruction. These striking paintings transform a commonly found shrub into a sublime emblem of baroque excess that overwhelms the basic understanding of what we consider normal and natural. Finally, Neon Cyprus (2010/16) hangs suspended from the ceiling; a multi-coloured series of neon tubes that coincide to form the outline of the island. This sequence speaks of a divided identity, whilst also alluding to a unity that does not yet exist. The individual colours each represent one of the regimes that has previously governed the island: the Ottoman imperial, the British colonial, the nationalist republican and the federal EU. The work attests to the malleability of identity, as each administration is superseded and fades into irrelevance; particularly in light of unfolding, global, ecological genocide; the consequences of which Cyprus faces today. Negative Ecstasy celebrates the surprise of the plethoric encounter, yet far from being empty hedonism, these works have worldly matters to address. The exhibition may conjure moments that appear mystical or mythic, but the works are sincerely and firmly grounded in problematic mortal reality. As Bataille notes: “[M]an is divine, but he is not supremely so, since he is real”. Mustafa Hulusi (b.1971, UK) lives and works in London and Cyprus. He has shown internationally including solo exhibitions at Meliksetian | Briggs, Los Angeles; The Page Gallery, Seoul; Max Wigram Gallery, London; Patrick Painter, Los Angeles; and in group exhibitions at Centre for Fine Arts (BOZAR), Brussels; Los Angeles Stock Exchange, Los Angeles; Saatchi Gallery, London; Stedelijk Museum Bureau, Amsterdam; RODEO Gallery, Istanbul; MoMA PS1, New York. In 2007 Hulusi represented Cyprus with Haris Epaminonda for the 52nd Venice Biennale. Negative Ecstasy is curated by November Paynter. For detailed information please contact the gallery at info [​at​] dirimart.com or T +90 212 232 66 66.